Welcome to all link-up bloggers, old and new! +Who watched the Bachelor in Paradise finale? Thoughts? I have many. +Also, I'm pretty thrilled that Nick is the new Bachelor. He has personality (unlike Ben) and he can't blame naivety for his dumb decisions (like Jojo). Also, I'll get a life as soon as the opportunity arises. +Who is all caught up on Once Upon a Time? I just finished season 5 on Netflix. Ugh. I cried a few times. My love for Hook: it's never-ending. New episodes start September 25th! +I love my new vacuum. Truthfully it looks a bit alien-like and I didn't want to get it for that very reason. But there's form and functionality to the design and it WORKS. +Also...it's FALL. 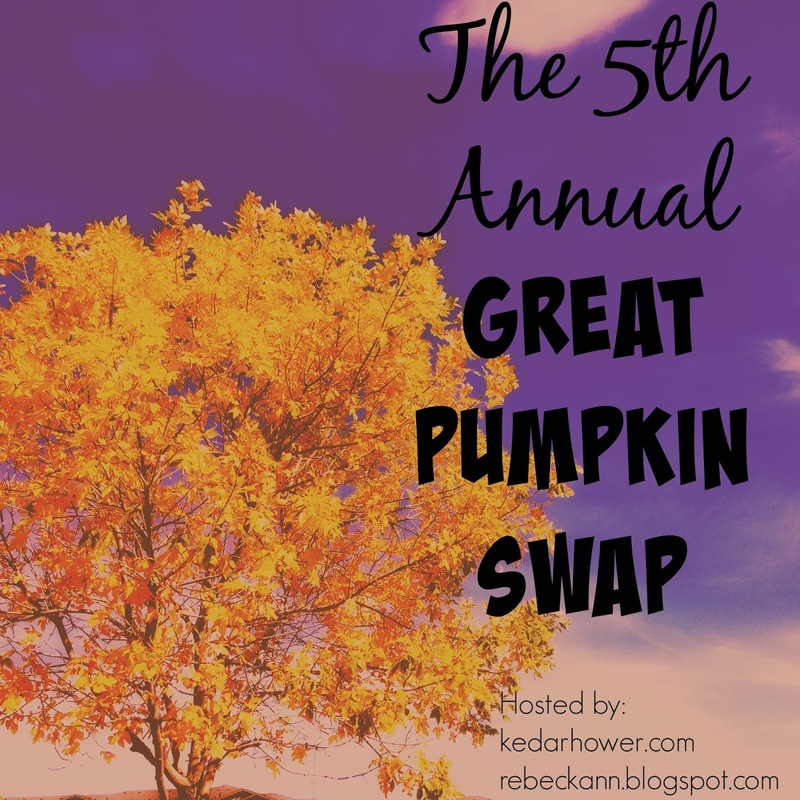 Which means we're Pumpkin Swapping! Just putting it out there...look for the sign-up at the end of the month! Labels: Once Upon a Time, Stuff and Things, T.V. Your comment "I'll get a life as soon as the opportunity arises" made me giggle. 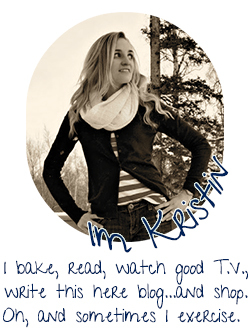 I have to admit, sometimes I feel a little left out because I can't participate in blog swaps. Boo hoo, first world problem, I know. ha! I followed Season 5 of Once Upon a Time in real time and the 2nd half was completely heartbreaking. I'm glad that it's almost finally time for the next season! I, too, chuckled at your getting a life comment. :) Happy to see this link return! Have a great Thursday! Hook is the reason I have stuck with OUAT... he is just SOOOOO perfect. A new vacuum is like a new lease on life. 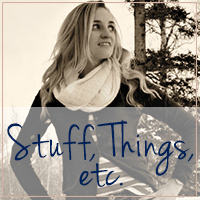 Hooray for the return of Stuff & Things! I'm thrilled that vacuum worked out for you. I got bored with OUAT and never made it past season...2?? BIP...I could barely stomach Josh and Amanda's proposal. I actually liked her in Ben's season because I thought she was bright and sweet, but now she just looks like a total bimbo. And his "Mmmmmmhhh!! That was so sweet!!" after her speech...gag me with a pitchfork. I'm excited for Nick to be the bachelor mainly because I didn't watch his original season... so it's like someone "new" to me! 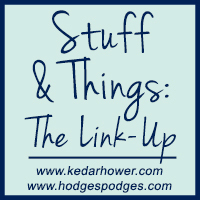 Thank you for bringing back this link-up and the swap! I'm excited for both. Ummm... #obsessed with Once Upon a Time. I kept up throughout the regular season, and the last two episodes had me in tears almost the entire time. I am also pretty much in love with Hook. Because, seriously. I finally caught up with BIP and I got to say that while Nick will be a good bachelor, I heard it was supposed to be Luke and they dumped him literally last minute. It will be interesting - I'm also looking forward to the Ben & Lauren show on Freeform. i am so behind on OUAT, i think i might need to start all over again. what happened to Hook? NO WAIT DON'T TELL ME. ooooooh your new vacuum is so pretty! very alien looking. so shiny and sleek.